Yesterday when I got home I just about had a heart attack, I was running up the stairs to grab something for Norah. I didn't have the lights on so I could barely see and on the back of one step there was a LARGE thing... It looked like a tarantula sized spider. I froze! For those of you who know me you know I HATE spiders and what I hate more than spiders are those house centipedes with there freaky freaky legs that go everywhere and they refuse to die and they secretly plot against you on how they are going to eat you!! Ok maybe that is an exaggeration but I HATE all large crawly things!! Totally just shivered describing the bugs that haunt me!! Anyway, I freaked out and ran downstairs to grab a shoe and turn the light on. WELL I discovered it wasn't a bug after all.... (silly me) it was just the paint peeling off the back of our stairs... BOOO!! Not as bad as a bug but equally crappy!! I think the old owners of our house quickly painted the back of the steps... they looked great but its a thin coat of paint... its streaky and starting to crack/peel in areas. Sorry for the quality of this photo I can't find my other photo! This is our stairs... will update with a better picture later. I loved the look but it took a LOT of work to wallpaper those stairs. Mostly because they weren't even. 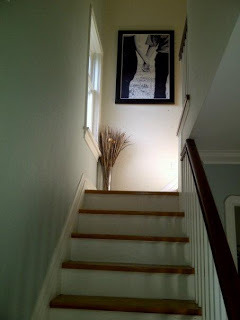 But the problem with wallpapering our current stairs would be because of the banister. The photo doesn't show it but part of the stair goes to the other side of the banister... making it VERY tricky to wallpaper. Thats why I hadn't even considered it before. While browsing Pinterest I came across this which is from Martha Stewart. I LOVE this idea!! 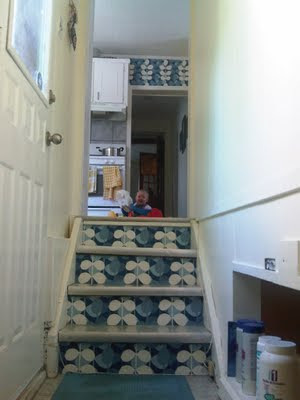 I know I have to repaint the stairs... why not add a super cool stencil!